Tag Archives: de Havilland Aircraft Co. Ltd.
8 April 1954: Suid-Afrikaanse Lugdiens (South African Airways) Flight 201, a chartered British Overseas Airways Corporation de Havilland DH.106 Comet 1, departed Rome at 1832 UTC, bound for Cairo. The Comet, registered G-ALYY, was under the command of Captain Wilhelm K. Mostert, with First Officer Barent J. Grove, Navigator Albert E. Sissing, Radio Officer Bertram E. Webstock, and Flight Engineer August R. Lagesen. Air Hostess Pamela L. Reitz and Flight Steward Jacobus B. Hok were in the passenger compartment with the 14 passengers. As the airliner climbed toward 35,000 feet (10,668 meters), they made several position reports. Last heard from at 1907 UTC, radioing an expected arrival time at Cairo, the Comet disintegrated in flight and fell into the Tyrrhenian Sea. Searchers found a debris field and floating bodies the next day near the volcanic island of Stromboli. All 21 persons aboard were killed. This was the second catastrophic failure of a DH.106 in just three months. 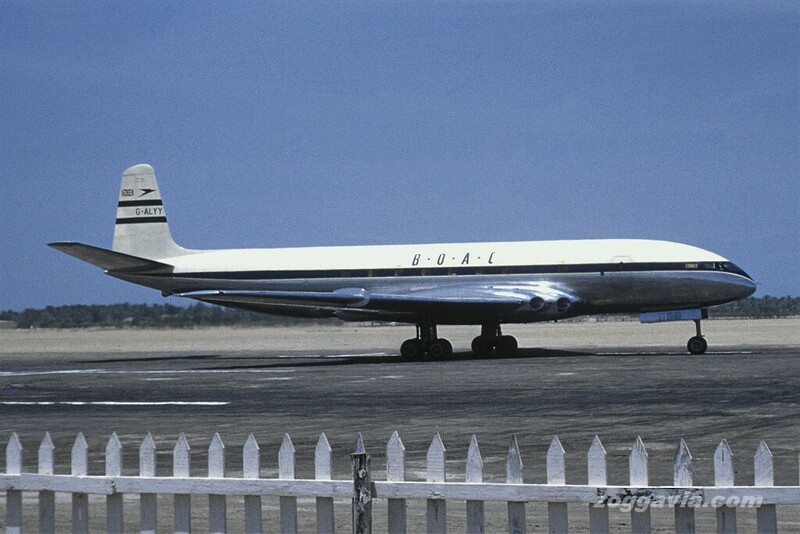 BOAC immediately grounded its entire Comet fleet, and the British Air Ministry revoked the airliner’s certificate of airworthiness. Production of the airliner at de Havilland was halted. The first crash had been presumed to be a result of an in-flight fire, and the second, an uncontained turbine engine failure. But an extensive investigation eventually determined that the cause of both crashes was the in-flight break up of the fuselage pressure hull. Metal fatigue of the fuselage was caused by the repeated expansion and contraction of pressurization cycles. Cracks in the aluminum skin formed at corners of the passenger compartment windows and then spread outward. This resulted in catastrophic explosive decompression. Cut-away illustration of de Havilland Comet I G-ALYP by artist Laurence Dunn. The DH.106 Comet 1 was the first production version and was very similar to the two prototypes. It can be visually identified by its square passenger windows. It was flown by a pilot, co-pilot, flight engineer and navigator. The airliner could carry up to 44 passengers. The airplane was 93 feet (28.346 meters) long with a wingspan of 115 feet (35.052 meters) and overall height of 27 feet, 10 inches (8.484 meters). The wings were swept 20°, as measured at ¼ chord. 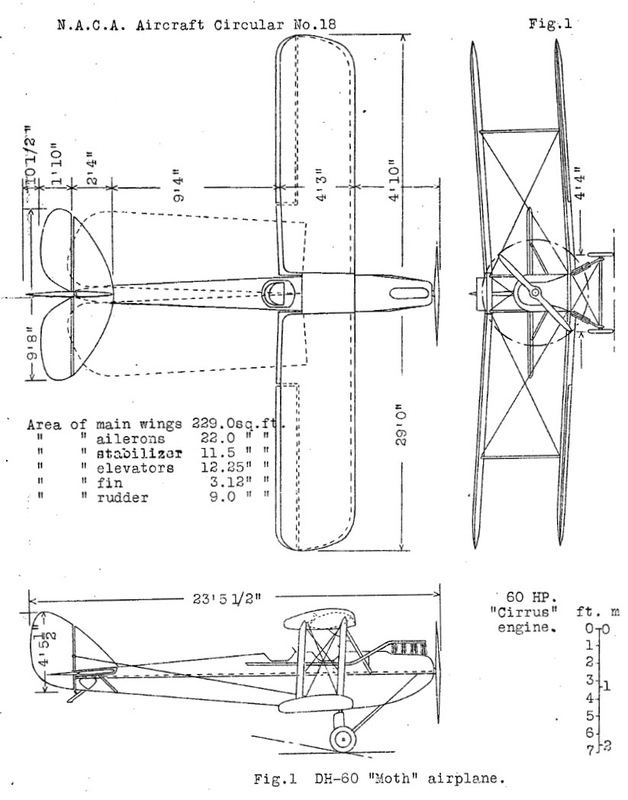 The fuselage had a maximum outside diameter of 10 feet, 3 inches (3.124 meters), and 9 feet, 9 inches (2.972 meters) inside. The Comet 1 had an authorised maximum all-up weight of 107,000 pounds (48,534 kilograms). The Comet I was powered by four de Havilland Engine Co., Ltd., Ghost 50 Mk.I turbojet engines. The Ghost was a single-shaft centrifugal-flow turbojet with a single-stage compressor, 10 combustion chambers and a single-stage turbine. It was rated at 5,000 pounds of thrust (22.24 kilonewtons) at 10,250 r.p.m. The Ghost 50 had a maximum diameter of 4 feet, 5 inches (1.346 meters), length of 10 feet, 1 inch (3.073 meters) and dry weight of 2,218 pounds (1,006 kilograms). When first placed in service, the engines required a combustion chamber inspection at 125 hour intervals. A complete overhaul was required every 375 hours. The Ghost was the first turbojet certified for civil airliner operations. 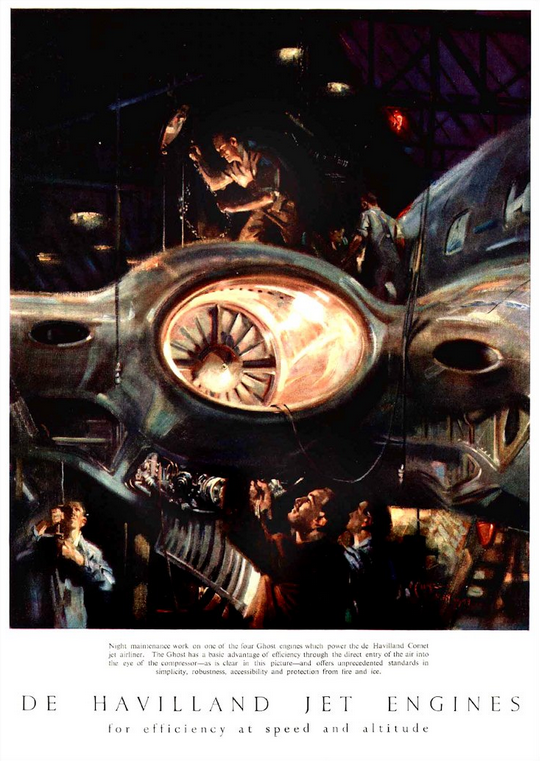 A de Havilland Engine Company advertisement in the Illustrated London News, circa 1950. The Comet I had a maximum cruising speed of 490 miles per hour (789 kilometers per hour), True Air Speed, and operating altitude of 35,000 to 40,000 feet (10,668–12,192 meters). 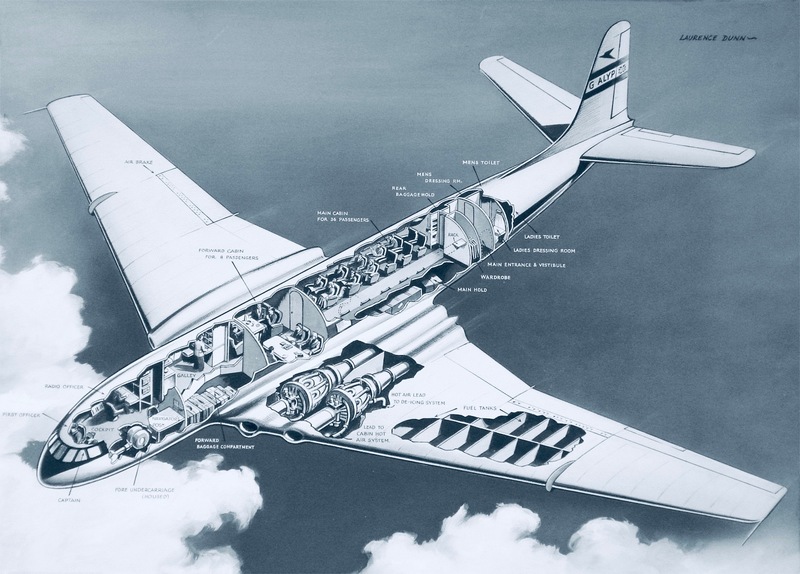 The airliner’s fuel capacity was 6,050 Imperial gallons (27,504 liters, or 7,266 U.S. gallons) giving a practical stage length of 2,140 miles (3,444 kilometers). The maximum range was 3,860 miles (6,212 kilometers). 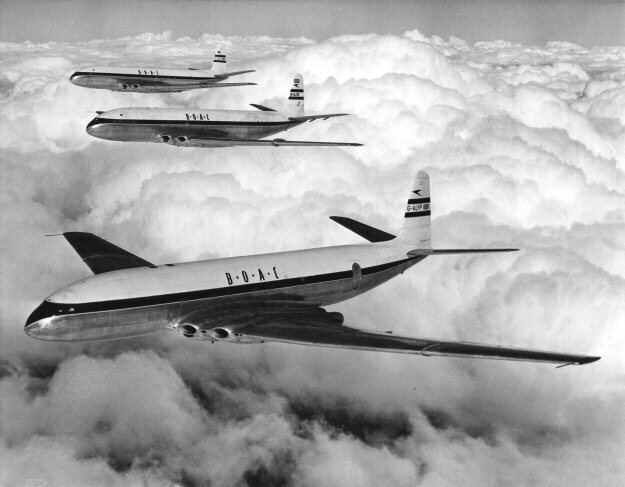 Twelve DH.106 Comet 1 airliners were built. The de Havilland Comet was the first commercial jet airliner and its introduction had revolutionized the industry. The two disasters were a blow from which the company never really recovered. A. E. Clouston on the wing of Australian Anniversary, Croydon, 26 March 1938. 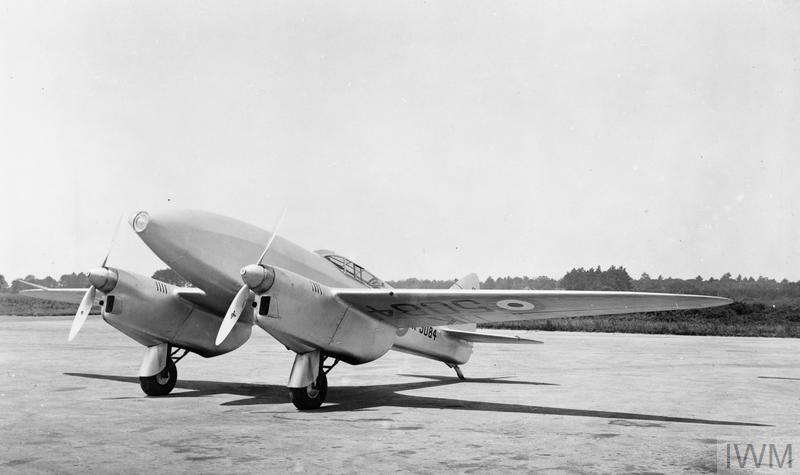 The Comet was one of three built especially for the 1934 MacRobertson Trophy Air Race, England to Australia, which it had won with an elapsed time of 70 hours, 54 minutes. Clouston and Ricketts departed Gravesend, Kent, England, at 8:17 p.m., Tuesday, 15 March 1938. They arrived at Blenheim, on New Zealand’s South Island, at 04:57 G.M.T., Sunday, 20 March. They began the return trip at 10:20 G.M.T., 21 March. Set down thus in bare figures, that it may be kept on record, the story of the flight sounds, perhaps, prosaic. But against this background may be pictured the actual sensations of the two men who made it; the ten-hour 2,000-miles stretches, sometimes protracted to 12 hours by head winds; the incessant roar, scream and bumping in the cramped tandem cockpit, the desire for sleep; the anxieties of taking-off from small aerodromes in “thin” tropical air with nearly a ton of petrol; fog, cloud and thunderstorms, all of which were encountered. These things considered, one may marvel at the enthusiasm of people who will do them—and it so happens that quite “uncommercial” enthusiasm has played a large share in the present flight. 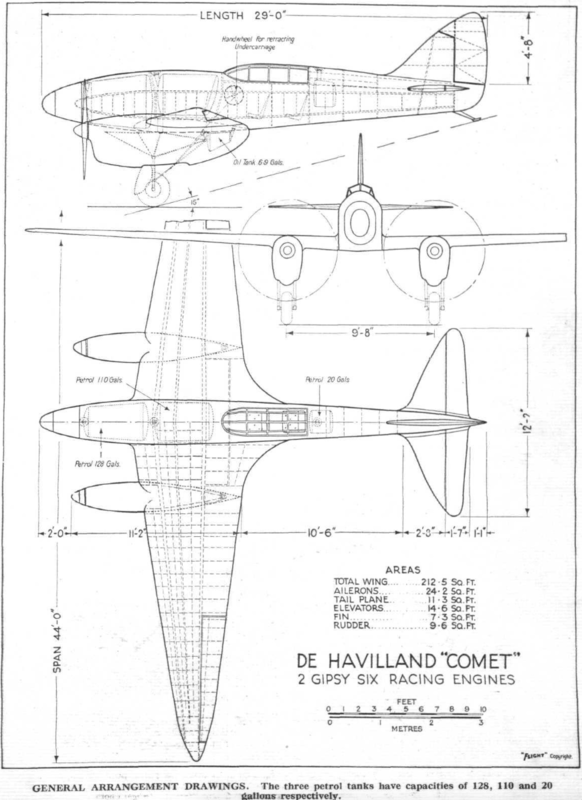 The de Havilland DH.88 Comet was a two-place, twin engine monoplane with retractable landing gear. It was built of wood, with a framework covered with spruce plywood for the skin of the fuselage, and a layer of doped fabric covering the wings. The airplane was 29 feet, 0 inches (8.839 meters) long with a wingspan of 44 feet, 0 inches (13.411 meters) and overall height of 10 feet, 0 inches (3.048 meters). It had an empty weight of 2,930 pounds (1,329 kilograms) and loaded weight of 5,500 pounds (2,495 kilograms). The Comet was originally powered by two air-cooled, normally-aspirated, 9.186 liter (560.573-cubic-inch-displacement) de Havilland Gipsy Six R engines. 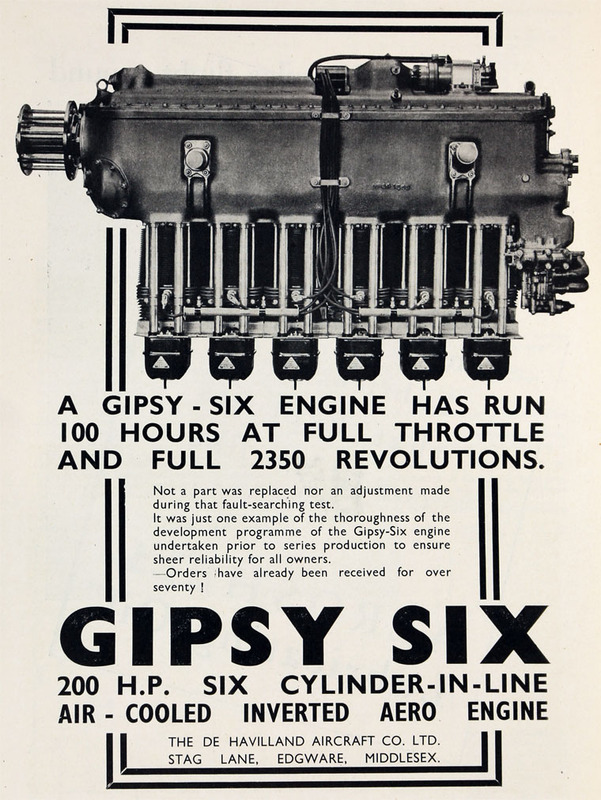 The Gipsy Six was an inverted, inline six-cylinder, direct-drive engine. The R version had the compression ratio increased from 5.25:1 to 6.5:1, and produced 223 horsepower at 2,400 r.p.m. for takeoff. The engines turned two-bladed, variable pitch propellers. 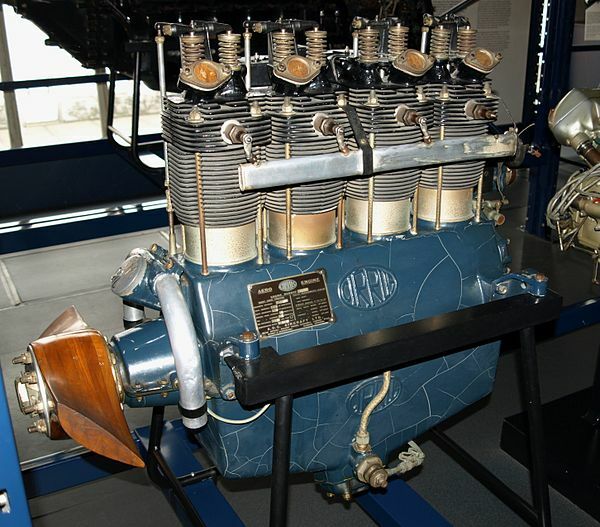 The Gipsy Six R engine was designed by Major Frank Bernard Halford C.B.E. F.R.Ae.S., who had designed the four-cylinder de Havilland Gipsy engines and would later design the Goblin and Ghost turbojet engines. Halford was awarded the Silver Medal by the Royal Aeronautical Society for his work on the DH.88 Comet in the MacRobertson race. The DH.88 had maximum speed of 255 miles per hour (410 kilometers per hour). Its range was 2,925 miles (4,707 kilometers). The service ceiling was 19,000 feet (5,791 meters). Two additional DH.88 Comets were built. Of the five, one crashed in the Sudan in 1935. The crew safely bailed out. Two more were destroyed in a hangar fire at Istres, France, in June 1940. G-ACSP, Black Magic, which had been flown by Jim and Amy Mollison in the MacRobertson Trophy Race, was located in Portugal and is under restoration at Derby Airfield, England. De Havilland DH.88 Comet c/s 1966 was purchased by Arthur Octavius Edwards (better known, simply, as A.O. Edwards), and registered G-ACSS, 4 September 1934. Edwards named the airplane Grosvenor House, after a luxury hotel in Park Lane which he had developed from “the biggest and most spectacular” mansion in London. In June 1935, G-ACSS was “taken charge” by the Air Ministry for flight testing. It was re-painted silver and assigned the RAF identification K5084. While undergoing flight testing, the Comet was damaged during a landing at the Aircraft & Armaments Engineering Establishment (A&AEE) at RAF Martlesham Heath and sold as scrap. It was purchased by Frederick E. Tasker, an architect famous for his Art Deco buildings, and rebuilt by Essex Aero Ltd., Gravesend. Essex replaced the Gipsy Six R engines with Gipsy Six Series II angines. By June 1937 the racer was once again airworthy. It carried the identification mark “E.1” on the fuselage before reverting to G-ACSS. 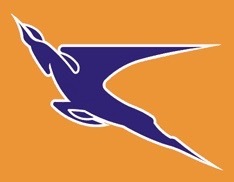 Flown by A.E. Clouston, it competed in the Istres–Damascus–Paris air race of August 1937, placing fourth. The Comet was placed in storage and scavenged for parts during World War II. 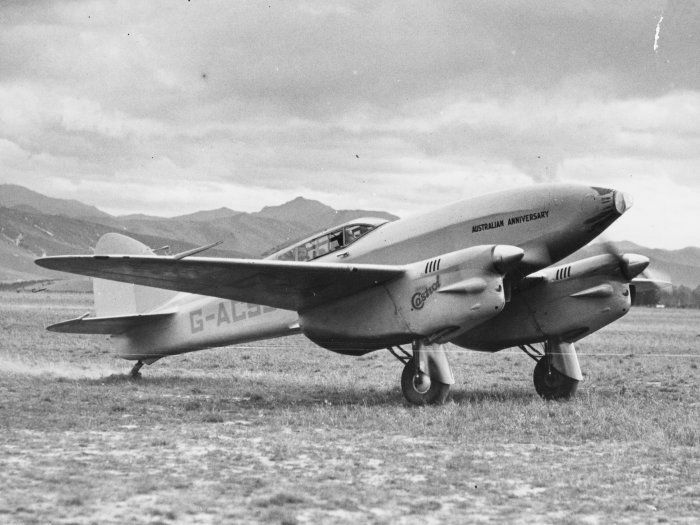 De Havilland employees restored G-ACSS in 1951. It was donated to The Shuttleworth Collection in 1965. 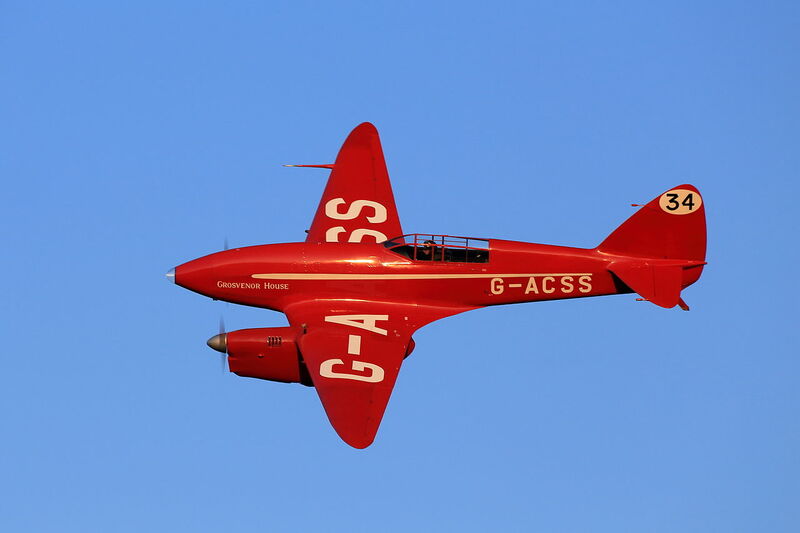 G-ACSS has been restored to flying condition and is in the Shuttleworth Collection at Old Warden Aerodrome, Bedfordshire, England. 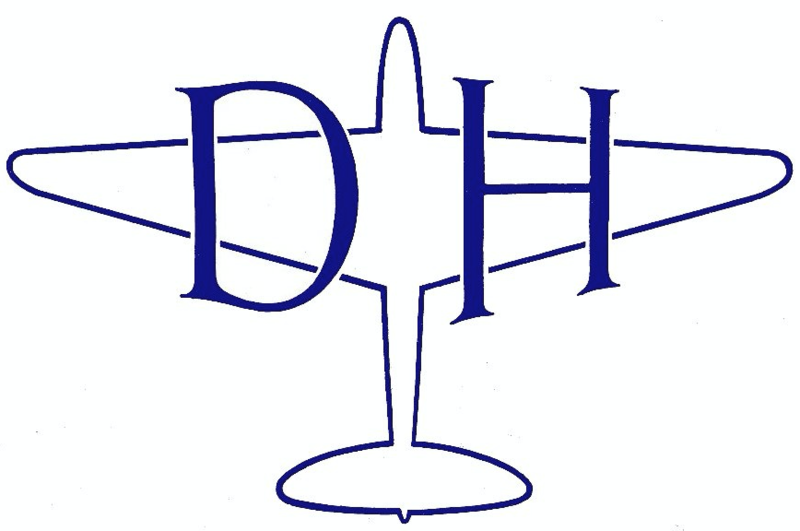 De Havilland’s experience with the Comet led directly to their success with its big brother, the famous World War II fighter bomber, the DH.98 Mosquito. Pilot Officer Victor Anthony Ricketts, DFC, Royal Air Force. ² Flight Lieutenant Victor Anthony Ricketts, D.F.C., Royal Air Force Volunteer Reserve (77341), flying a DH.98 Mosquito B Mk IV with No. 248 Squadron, was killed in action 12 July 1942. ³ FAI Record File Numbers: 13253, 19 March 1938, 209,71 km/h (130.31 m.p.h. ); 13254, 20 March 1938, 180,26 km/h (111.85 m.p.h. ); 13255, 26 March 1938, 134,31 km/h (83.46 m.p.h. );, and 13256, 26 March 1938, 130,78 km/h (81.26 m.p.h.). John Cunningham with the record-setting de Havilland DH.100 Vampire F.1, TG/278. Note the metal canopy with porthole. (BNPS). The de Havilland DH.100 Vampire F.1 flown by Cunningham was the fifth production aircraft, TG/278. It was built by the English Electric Company at Preston, Lancashire, with final assembly at Samlesbury Aerodrome, and made its first flight in August 1945. 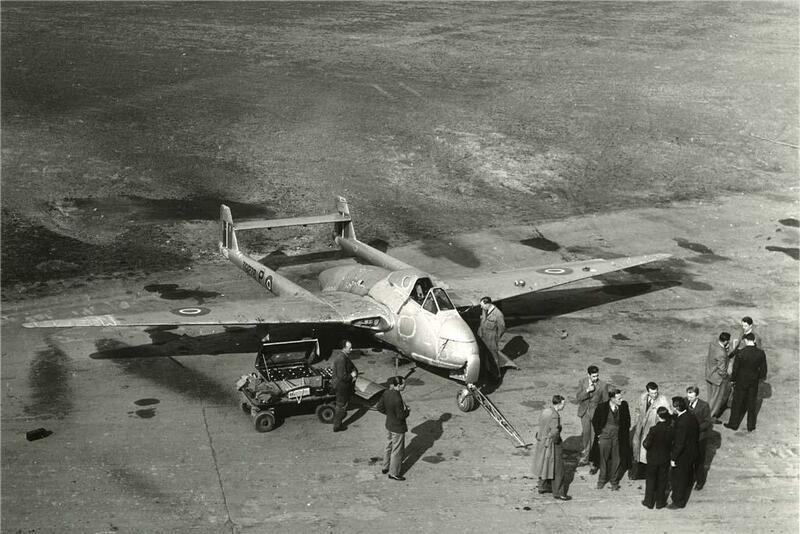 It was intended as a prototype photo reconnaissance airplane. The cockpit was heated and pressurized for high altitude, and a metal canopy installed. The photo reconnaissance project was dropped and TG/278 became a test bed for the de Havilland Engine Company Ghost 2 turbojet (Halford H.2), which produced 4,400 pounds of thrust (19.57 kilonewtons) at 10,000 r.p.m. The Vampire could take the Ghost engine to altitudes beyond the reach of the Avro Lancaster/Ghost test bed already in use. The airplane’s wing tips were each extended 4 feet (1.219 meters) to increase lift. The aircraft was stripped of paint to reduce weight. Smaller batteries were used and placed in normal ballast locations. Special instrumentation and recording cine cameras were installed in the gun compartment, and ten cylinders of compressed air for breathing replaced the Vampire’s radio equipment. At takeoff, the Vampire carried 202 gallons (765 liters) of fuel, 40 gallons less than maximum, sufficient for only one hour of flight. The takeoff weight of TG/278 was 8,400 pounds (3,810 kilograms). TG/278 continued as a test aircraft until it was damaged by an engine fire in October 1950. It was used as an instructional airframe at RAF Halton. A standard Vampire F.1 was 9.370 meters (30 feet, 8.9 inches) long with a wingspan of 12.192 meters (40 feet, 0 inches) and overall height of 2.700 meters (8 feet, 10.3 inches). The fighter had an empty weight of 6,380 pounds (2,894 kilograms) and gross weight of 8,587 pounds (3,895 kilograms). 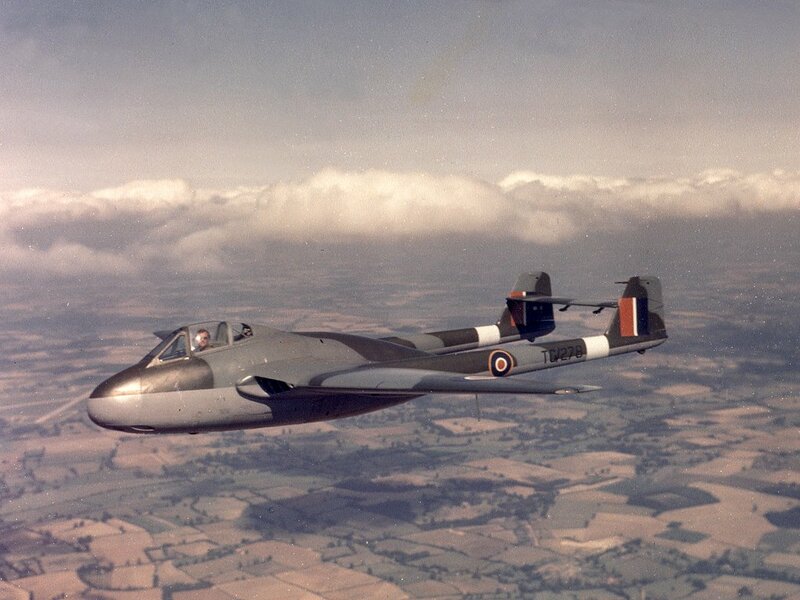 The basic Vampire F.1 was powered by a de Havilland-built Halford H.1B Goblin turbojet engine. This engine used a single-stage centrifugal-flow compressor and single-stage axial-flow turbine. It had a straight-through configuration rather than the reverse-flow of the Whittle turbojet from which it was derived. It produced 2,460 pounds of thrust (10.94 kilonewtons) at 9,500 r.p.m., and 3,000 pounds (13.34 kilonewtons) at 10,500 r.p.m. The Goblin weighed approximately 1,300 pounds (590 kilograms). It had a maximum speed of 540 miles per hour (869 kilometers per hour), a service ceiling of 41,000 feet (12,497 meters) and range of 730 miles (1,175 kilometers). 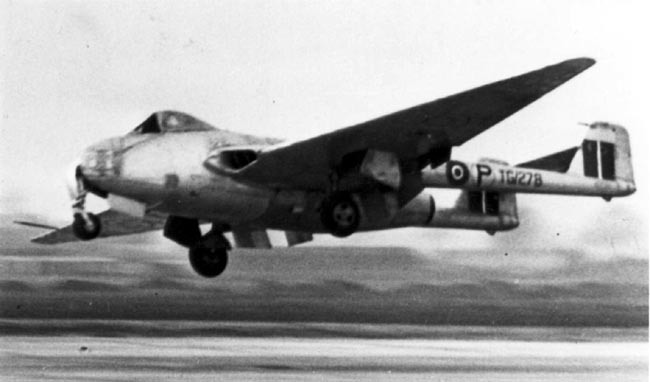 The Vampire F.1 was armed with four 20 mm Hispano autocannon in the nose, with 150 rounds of ammunition per gun. 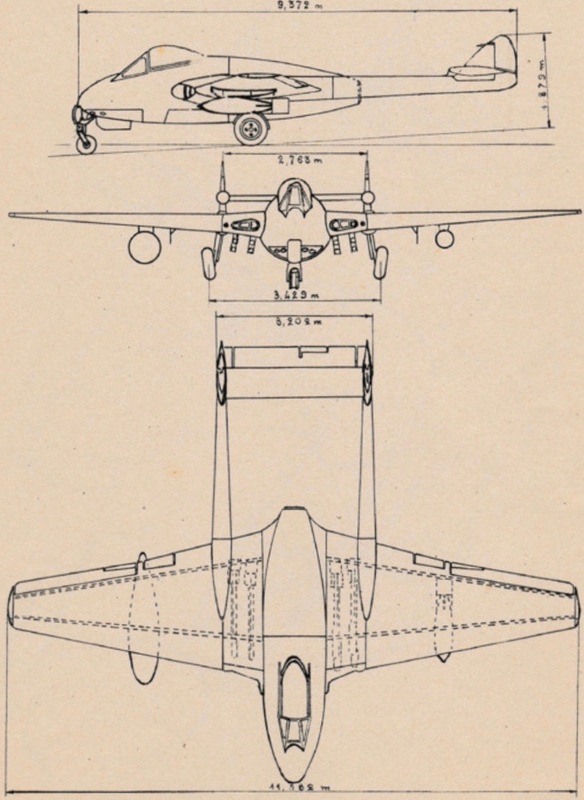 De Havilland DH.100 Vampire FB.5 three-view illustration with dimensions. Group Captain John Cunningham C.B.E., D.S.O. and Two Bars, D.F.C. and Bar, A.E., D.L., F.R.Ae.S, was born 1917 and educated at Croydon. In 1935 he became an apprentice at De Havilland’s and also joined the Auxiliary Air Force, where he trained as a pilot. He was commissioned as a Pilot Officer, 7 May 1936, and was promoted to Flying Officer, 5 December 1937. Cunningham was called to active duty in August 1939, just before World War II began, and promoted to Flight Lieutenant, 12 March 1940. “This officer has continued to display the highest devotion to duty in night fighting operations. One night in April, 1941, he destroyed two enemy bombers during a single patrol and a week later destroyed three enemy raiders during three different patrols. Squadron Leader Cunningham has now destroyed at least ten enemy aircraft and damaged a number of others. His courage and skill are an inspiration to all.” —The London Gazette, 29 April 1941, Page 2445 at Column 1. 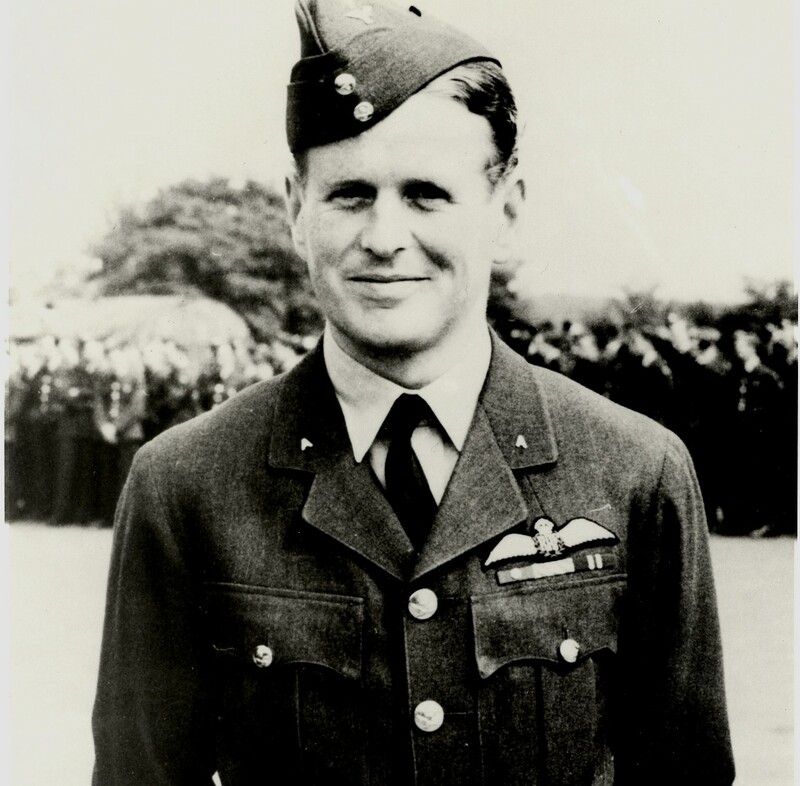 Acting Squadron Leader Cunningham’s promotion to Squadron Leader (Temporary) became official 10 June 1941. The King approved the award of a Bar to his Distinguished Flying Cross, 19 September 1941. 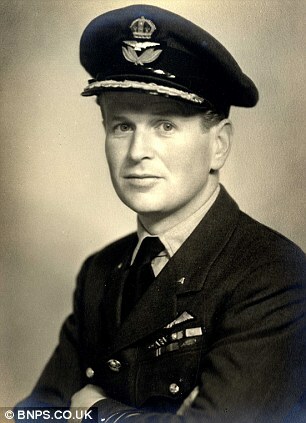 Squadron Leader Cunningham took command of No. 604 Squadron 1 August 1946. “Within a recent period Wing Commander Cunningham has destroyed three more hostile aircraft and his last success on the night of 2nd January, 1944, brings his total victories to 20, all with the exception of one being obtained at night. He is a magnificent leader, whose exceptional ability and wide knowledge of every aspect of night flying has contributed in large measure to the high standard of operational efficiency of his squadron which has destroyed a very large number of enemy aircraft. His iron determination and unswerving devotion to duty have set an example beyond praise. —The London Gazette, 3 March 1944, Page 1059 at Column 1. Promoted to Group Captain 3 July 1944, Cunningham was the highest scoring Royal Air Force night fighter pilot of World War II, credited with shooting down 20 enemy airplanes. He was responsible for the myth that eating carrots would improve night vision. In addition to the medals awarded by the United Kingdom, he also held the United States Silver Star, and the Union of Soviet Socialist Republics Order of the patriotic War (1st Class). Following the War, John Cunningham returned to de Havilland as a test pilot. 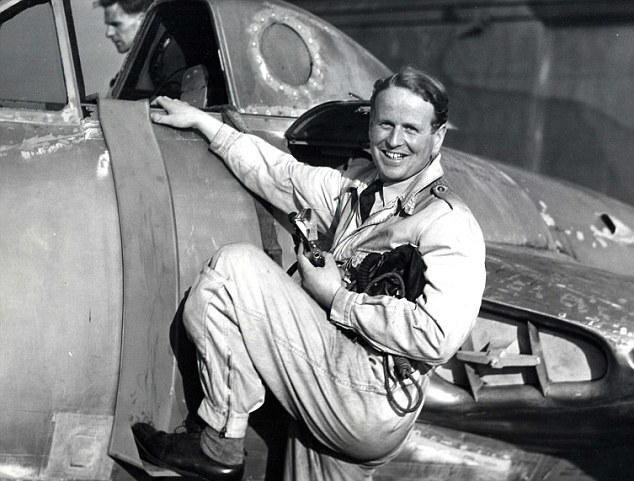 After the death of Geoffrey Raoul de Havilland, Jr., in 1946, Cunningham became the de Havilland’s chief test pilot. He remained with the firm through a series of mergers, finally retiring in 1980. Cunningham was appointed an Officer of the Most Excellent Order of the British Empire (O.B.E.) in 1951, and promoted to Commander of the Most Excellent Order of the British Empire (C.B.E.) in 1963. He relinquished his Auxiliary Air Force commission 1 August 1967. 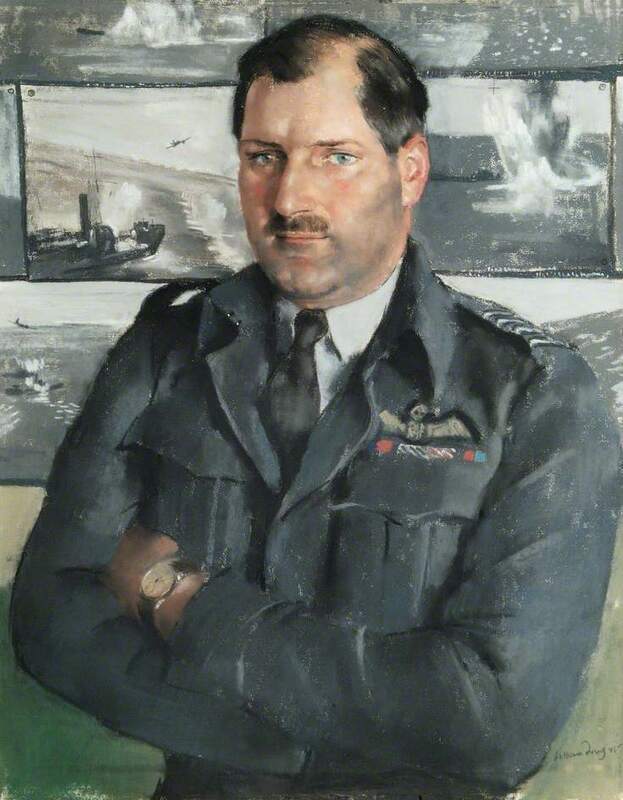 Group Captain John Cunningham C.B.E., D.S.O. and Two Bars, D.F.C. and Bar, A.E., D.L., died 21 July 2002 at the age of 84 years. 22 February 1925: At the de Havilland Aircraft Company airfield at Stag Lane, Edgeware, London, Geoffrey de Havilland, O.B.E., took his new DH.60 Moth, c/n 168 (later registered G-EBKT), for its first flight. The DH.60 was a light-weight, two-place, single-engine, single-bay biplane. The fuselage was constructed of plywood and the wings and tail surfaces were covered with fabric. The Moth was 23 feet, 5½ inches (7.150 meters) long with a wingspan of 29 feet, 0 inches (8.839 meters) and overall height of 8 feet, 9½ inches (2.680 meters). The airplane was designed so that the wings could be folded parallel to the fuselage, giving it an approximate width of 9 feet (2.7 meters). The wings had a chord of 4 feet, 3 inches and the lower wing was staggered slightly behind the upper. Their total area was 229.0 square feet (21.3 square meters). The vertical gap between the wings was 4 feet, 10 inches (1.473 meters) and lower wing was staggered 3 inches (7.62 centimeters) behind the upper. Both wings had 3.5° angle of incidence and 3.5° dihedral. There was no sweep. The DH.60 had an empty weight of 764 pounds (346.6 kilograms) and its gross weight was 1,650 pounds (748 kilograms). The Moth was powered by an air-cooled, normally-aspirated 4.503 liter (274.771-cubic-inch-displacement A.D.C. Aircraft Ltd., Cirrus inline 4-cylinder overhead valve engine with two valves per cylinder and a compression ratio of 5.4:1. The direct-drive engine produced 60 horsepower at 1,800 r.p.m., and 65 horsepower at 2,000 r.p.m. The Cirrus was 0.983 meters (3.225 feet) long, 0.908 meters (2.979 feet) high and 0.450 meters (1.476 feet) wide. It weighed 260 pounds (118 kilograms). The A.D.C. 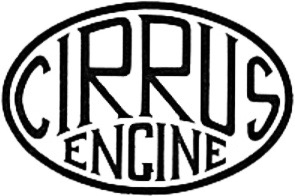 Cirrus was designed by Major Frank Bernard Halford, who later designed the de Havilland Gipsy engine, as well as the Goblin and Ghost turbojet engines. De Havilland built 8 pre-production and 31 production DH.60 Moths. 595 DH.60s of all variants were produced at Stag Lane. On 29 May 1925, Alan Cobham flew the prototype from Croydon to Zurich and back in 14 hours, 49 minutes. 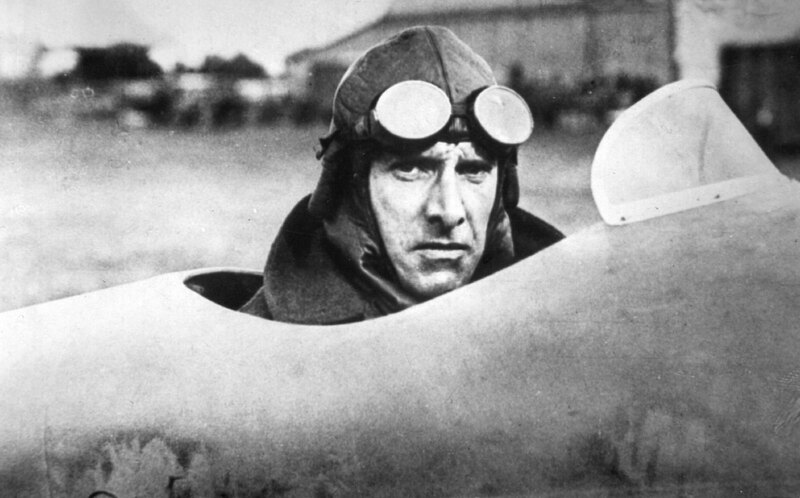 Cobham also flew the Moth in The Kings Cup Air Race, though weather forced him to land short of the finish. It placed second in a follow-up race. 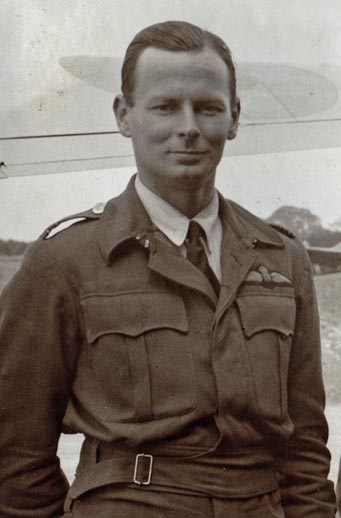 On Sunday afternoon, Pilot Officer Stanley Pritchard-Barrett, flying on D.H. “Moth” G-EBKT with his wife as passenger, crashed in the grounds of the residence of Major Sir Maurice FitzGerald,Bt. He was severely injured about his head, and his wife, who was a passenger, had a leg broken. The machine fell from a height of about 90 ft. The London Aeroplane Club “Moth” is apparently a complete write-off. 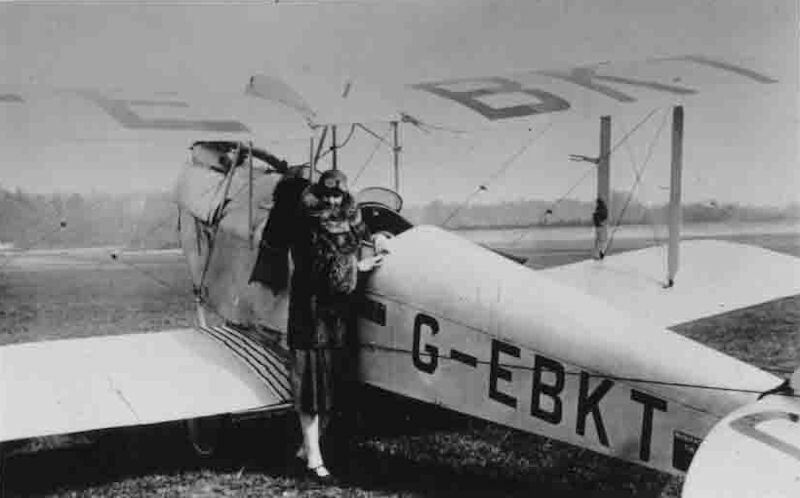 G-EBKT’s registration was cancelled 20 January 1928. 16 January 1929: After a 10-month, 18,000-mile (29,000-kilometer) solo flight from Croydon Aerodrome, London, England, to Cape Town, South Africa, Mary, Lady Bailey, arrived back at the Stag Lane Aerodrome at Edgeware, London, flying a de Havilland DH.60X Cirrus II Moth, G-EBTG. Lady Bailey landed at Croydon this afternoon in her De Havilland Moth aeroplane, thus completing a flight from London to Capetown and back. She was greeted at Croydon by a large and cheering crowd. 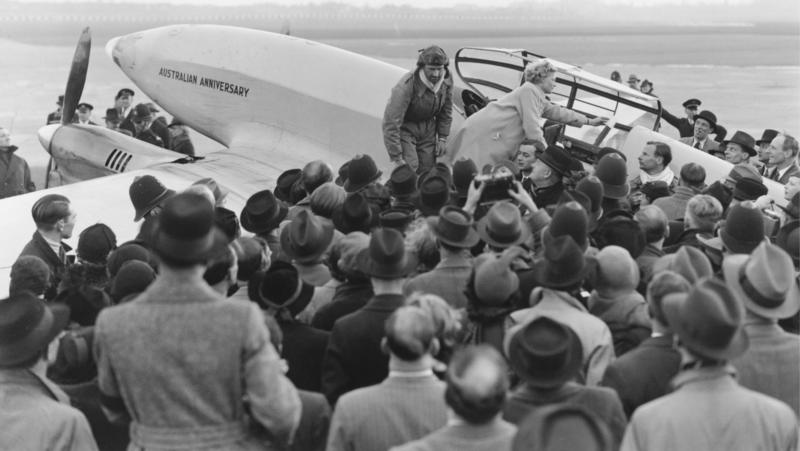 Lady Bailey is the first woman to fly from London to Capetown and back. She has made the longest flight ever accomplished by a woman, and her 18,000 miles journey is the longest solo flight by either a man or a woman. 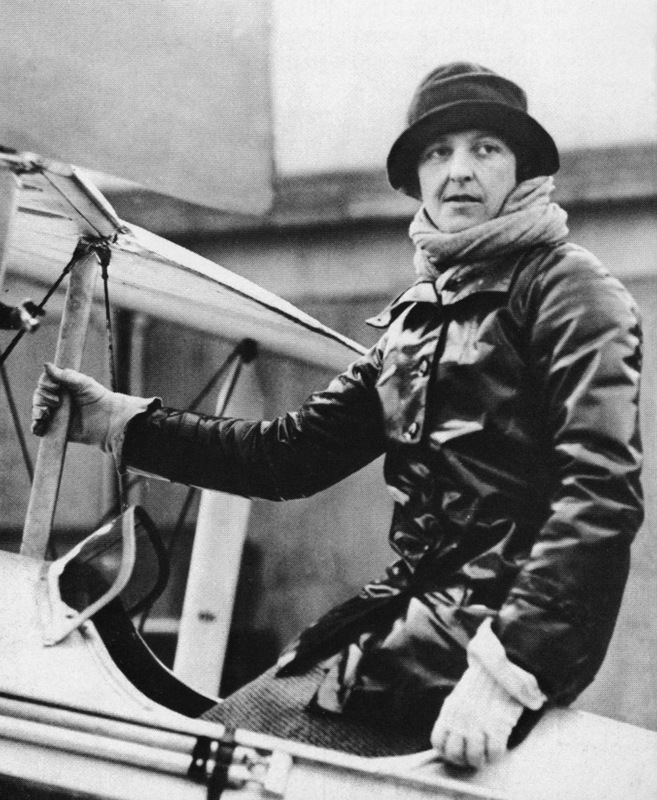 She is the first woman to have flown over the Congo and the Sahara. The Royal Aeronautical Society, in congratulating Lady Bailey, pays tribute to her as one of the gallant pioneers of Aeronautics. — The Sydney Morning Herald, No. 28,405. Friday, 18 January 1929, Page 13, Column 1. Exactly how many miles she has covered during her long flight is difficult to estimate; nor is this necessary for a full appreciation of the merits of Lady Bailey’s flight from London through Africa to the Cape, around Africa and home again. The general press has made much of the fact that Lady Bailey’s flight is the longest ever accomplished by a woman, and the longest solo flight ever undertaken, thus establishing two “records.” To us that is of very minor importance. What matters is that an Englishwoman should have chosen to see Africa from the air, and should have been prepared to rely entirely on her own resourcefulness in making the tour. Everyone who knows Lady Bailey at all well realises that personal “advertisement” is the last thing she would desire; she is the most modest and unassuming of women. But her great achievement must unavoidably bring her into the “limelight.” From her point of view the whole thing resolved itself into this: She wanted to tour Africa; she was already a private owner-pilot. What more natural, then, than that she should make the tour by air? Only those who have a fairly good knowledge of Africa, with its variety of country and climate, can realise the sort of task Lady Bailey set herself. That she should have completed the tour, as far as Paris, there to be held up by fogs, is but the irony of fate, and is an experience which has befallen many air travelers. Her great flight was in any case a tour and not a spectacular “stunt” flight intended to break records, so we should not let the delay on the final stage be regarded as other than one of many incidents on a tour that must have been full of surprises and disappointments. Through tropical heat, in rain or snow, across mountains, deserts and seas, Lady Bailey carried on with a quiet determination which is, we like to think, a characteristic of our race, and her de Havilland “Moth” and “Cirrus” engine did not let her down. England is proud of the trio and its achievements. — FLIGHT, The Aircraft Engineer & Airships, No. 1046. (No. 2. Vol. XXI.) 10 January 1929, at Page 20. Lady Bailey was born The Hon. 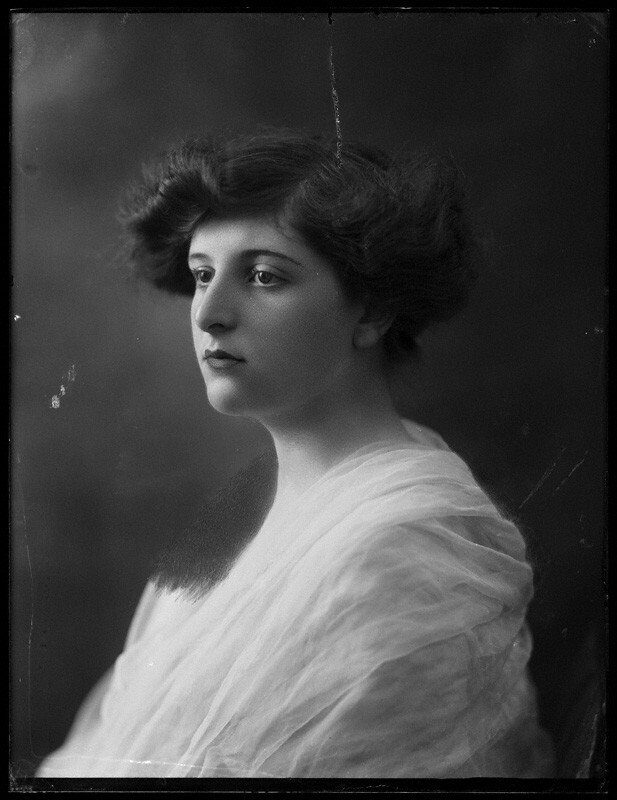 Mary Westenra, 1 December 1890, the daughter of the 5th Baron Rossmore. She married Colonel Sir Abe Bailey, 1st Bt., 5 September 1911 at the age of 20. 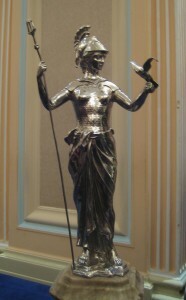 The Britannia Trophy of the Royal Aero Club of Great Britain. Soon after becoming a licensed pilot in early 1927 (Royal Aero Club Aviator’s Certificate 8067), she flew across the Irish Sea, the first woman to do so. She set a Fédération Aéronautique Internationale (FAI) World Record for Altitude, 5,268 meters (17,283 feet), 5 July 1927.¹ She set several long distance solo flight records, including an 8,000-mile flight from Croydon, South London, England, to Cape Town, South Africa, with her DH.60X Cirrus II Moth, G-EBSF, and an 10,000-mile return flight made with another DH.60 (after G-EBSF was damaged). These were the longest solo flight and the longest flight by a woman to that time. Lady Bailey was twice awarded the Harmon Trophy (1927, 1928). In 1930, she was invested Dame Commander of the Order of the British Empire. During World War II, The Hon. 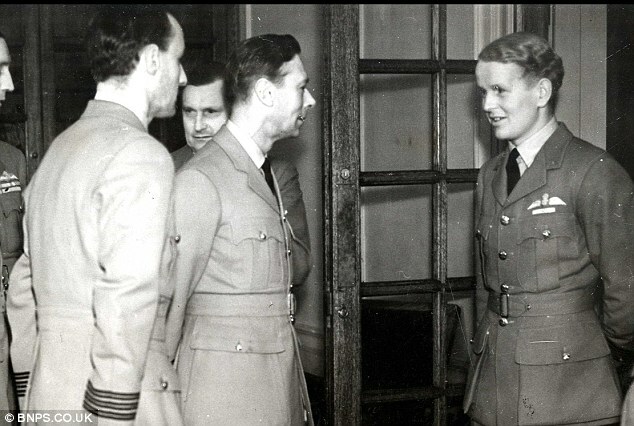 Dame Mary Bailey, D.B.E., served with the Women’s Auxiliary Air Force with the rank Section Officer, equivalent to a Royal Air Force sergeant. Lady Mary died 29 July 1960 at the age of 70. G-EBTG (s/n 469) was a de Havilland DH.60X Cirrus II Moth which had been sold to Lady Bailey by Commander Lionel Mansfield Robinson of Nairobi, Kenya, as a replacement for her own Moth, G-EBSF (s/n 415), which had been damaged at Tabora, Tanganyika, 4 October 1928. G-EBTG was reconditioned by de Havilland’s and a more powerful engine was installed. The airplane changed ownership several times, and was finally written off as damaged beyond repair after a collision with a furniture van in 1938. 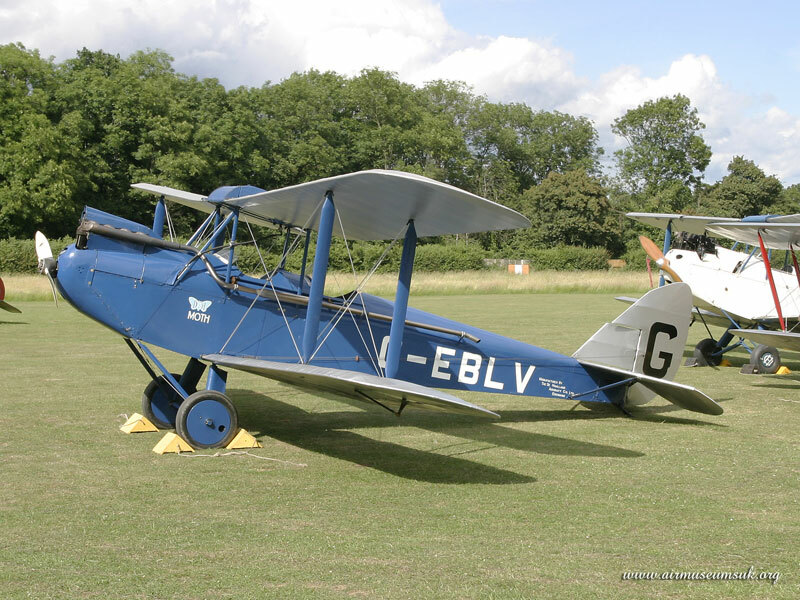 The de Havilland DH.60X Cirrus II Moth was a two-place, single-engine light biplane with a wooden airframe which was covered with plywood, with sheet metal panels around the engine. The wings and tail surfaces were fabric-covered, and the wings could be folded to fit inside a small hangar. The “X” in the type designation indicates that the airplane has a split-axle main landing gear, which forms an X when seen from the front of the airplane. The DH.60X Cirrus II Moth (also referred to as the Moth Type X) was 23 feet, 8½ inches (7.226 meters) long with a wingspan of 30 feet, 0 inches (9.144 meters). Its height was 8 feet, 9½ inches (2.680 meters). The airplane was designed so that the wings could be folded parallel to the fuselage, giving it a width of 9 feet, 10 inches (2.997 meters). 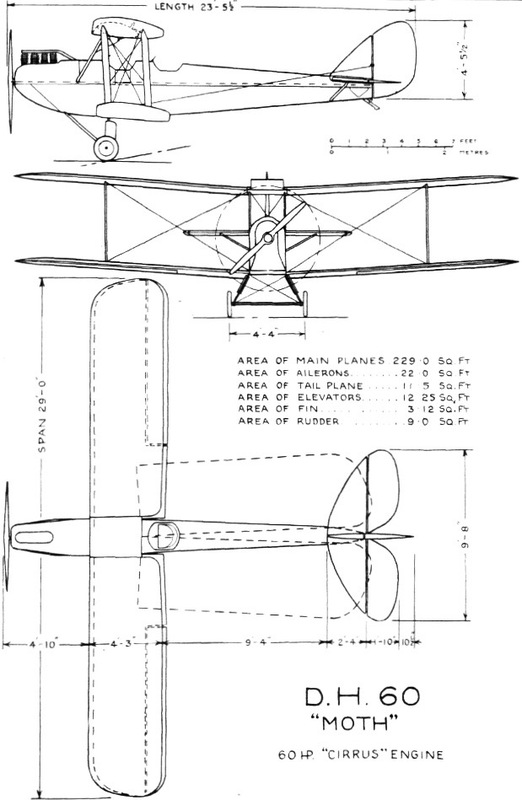 The wings had a chord of 4 feet, 4⅜ inches (1.330 meters). The vertical gap between the wings was 4 feet, 10 inches (1.473 meters) and lower wing was staggered 3 inches (7.62 centimeters) behind the upper. Both wings had 3.5° angle of incidence and 3.5° dihedral. There was no sweep. The airplane had an empty weight of 885 pounds (401 kilograms) and gross weight of 1,550 pounds (703 kilograms). The Cirrus II Moth was powered by an air-cooled, normally-aspirated 4.942 liter (301.563-cubic-inch-displacement) A.D.C. (Aircraft Disposal Corporation, Ltd.) Cirrus Mark II four-cylinder vertical inline engine. This was a right-hand tractor, direct-drive, overhead-valve engine with two valves per cylinder and a compression ratio of 4.9:1. It had a normal power rating of 78.5 horsepower at 1,800 r.p.m. and a maximum power rating of 84 horsepower at 2,000 r.p.m. The engine drove a two-bladed, fixed-pitch propeller. The Cirrus Mk.II was 1.165 meters (3 feet, 9.87 inches) long, 0.482 meters (1 foot, 6.98 inches) wide and 0.904 meters (2 feet, 11.59 inches) high. It weighed 268 pounds (121.56 kilograms). The DH.60X Cirrus II Moth had a cruise speed of 80–85 miles per hour (129–137 kilometers per hour) at 1,000 feet (305 meters). Its maximum speed at Sea Level was 102 miles per hour (164 kilometers per hour), and 97 miles per hour (156 kilometers per hour) at 5,000 feet (1,524 meters). It could climb to 5,000 feet (1,524 meters) in 14 minutes, and to 10,000 feet (3,048 meters) in 37 minutes. Its absolute ceiling was 14,000–15,000 feet (4,267–4,572 meters). The airplane’s maximum range was 410 miles (660 kilometers). In 1929, de Havilland offered the Moth Type X at a price of £650 (approximately £41,000, or $52,100, in 2019). 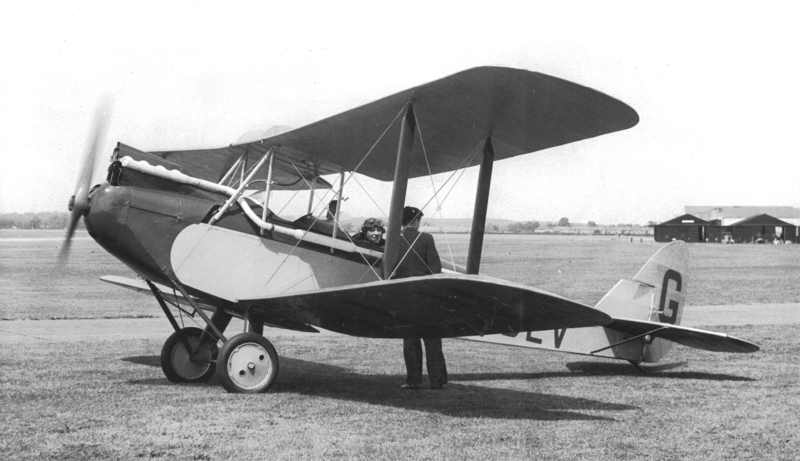 The de Havilland Aircraft Co., Ltd., built 32 of the DH.60 Cirrus II Moth variant. 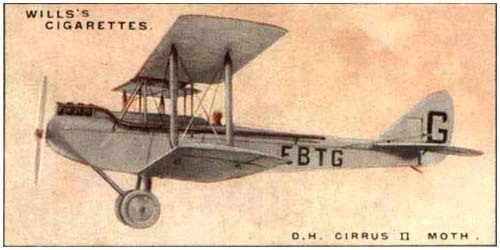 Nearly 900 of all DH.60 Moth models were built at the company’s factory at Stag Lane, and another 90 were built under license in Australia, France, and the United States.